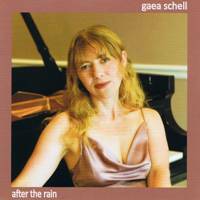 Description: Known among her peers for swinging every note, subtle phrasing, and lyrical writing, Gaea Schell is a Los Angeles-based pianist/composer/vocalist. Born in Canada, she grew up playing music from an early age. After graduating from the jazz program at acclaimed McGill University in Montreal, she went to New York to study with internationally known pianist/composer Richie Beirach. Following Dream Away from 2004 and For All We Know from 2007, After The Rain is her third CD, released from Canadian label Roadhouse Records. The album features her trio with drummer James Alsanders and the bass duties shared by Scott Steed and Roger Shew. Powerful bassist Chris Colangelo appears on one track ("Social Call") and tenor saxophonist Chuck Manning guests on three tracks. Schell's piano style is informed by her teacher Beirach, as well as by the traditions established by Oscar Peterson, Wynton Kelly and Bill Evans. Her playing is marked by subtle romanticism and distinctive, swinging touch. Though primarily a pianist, her singing has its own charms, with an intimate, whispering quality. This CD features wonderful--and sometimes surprising--interpretations of the standards and no less than six originals. If you haven't heard about her, this CD is a great place to start. Gaea Schell is a major talent and we are proud to have her in Los Angeles! Recorded April 13 and June 10 in Los Angeles.